Why Shop for Title Insurance? Buying or Selling a House? As if finding the right house, lender and title insurance company weren’t complicated enough, now you have to be cautious of fraudsters thousands of miles away trying to hack your email in an effort to divert your money into their bank account. According to the FBI, wire fraud on real estate transactions has increased more than 400% over the last five years. Often times cyber criminals use phishing scams to troll unsecure email accounts of buyers, sellers, real estate agents, attorneys and title companies...looking for an opportunity to steal your money. Wiring funds makes the closing process efficient, but if you’re not careful, it could also cost you your life’s savings. Tip #1: Pick up the phone. Email is quick and easy, but when it comes to guarding your life savings, take an extra few moments and use the phone. Confirm all wiring instructions with a simple phone call before transferring any funds. Use the phone number from the title company’s website or a business card. Remember, a reputable title company will not use an unsecure email account like yahoo or gmail to send you a wire request. Tip #2: Be suspicious of a change in plans. It’s uncommon for title companies to send you revised wiring instructions or ask you to wire funds to an account that is not in their name. If you’re wiring closing funds to XYZ Title, make sure it matches the bank account name listed on their wiring instructions. Save up to $750 or more at the settlement table with ALT Title. Tip #3: Confirm the details. Ask your bank to confirm not just the account number but also the name and location of the account before sending a wire. Under Federal Law your bank is only required to verify the account number and routing number. 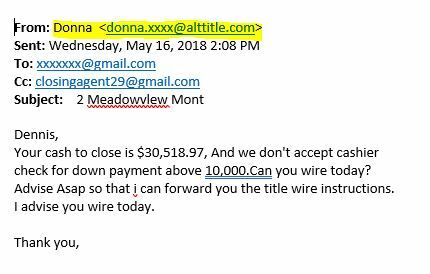 When wiring funds for closing, call the title company and let them know the date the wire is being sent and the amount. You should then call the title company to validate that the funds were received. If it’s been determined that your funds were wired to a fraudulent third party, immediately notify your bank and file a complaint at www.ic3.gov. Time is of the essence. The sooner the complaint is filed the better chance you have of your money being returned. 5 things our parents wish they knew about title insurance and how to save money at the settlement table! Look closely at the sender's email and look for telltale signs that it could be a scam. Read the body of the email carefully. Often times fraudulent emails don't sound professional and are not well written. If the email is filled with misspellings and poor grammar, there's a good chance it's fraudulent. Also, check for the company's usual email signature with contact info. If it is misspelled or missing altogether be very cautious. Even if the scammer has copied the company's contact information, you would notice when you hit reply that the email address is suddenly different. See our example, which was a failed attempt to defraud one of our clients, caught by Chase Bank. Note when the client replied, the email address for Donna became closingagent29@gmail.com. Settlement doesn't have to take all day. With a little preparation, and our 10 step checklist, you can be in and out in under an hour. If you receive an unexpected request by email or fax to wire funds for closing, there’s a good chance it’s fraudulent. If a title company requires you to wire funds for closing, the initial request will be by phone. Do I really need an Enhanced Owner's Title Insurance Policy or is the Standard Policy enough? This information is provided for educational purposes only. We are not offering legal advice.